Edited by three authorities in the field, this Handbook presents contributions from experts across the world who report the cutting-edge of international research. 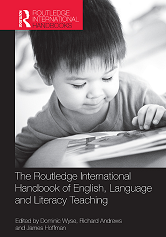 It is ground-breaking in its holistic, evidence-informed account that aims to synthesize key messages for policy and practice in English, language and literacy teaching. A comprehensive collection, the Handbook focuses on the three key areas of reading, writing, and language, and issues that cut across them. The international emphasis of all the chapters is extended by a final section that looks directly at different countries and continents.